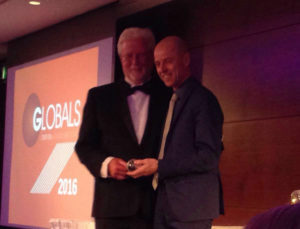 The Global awarded Frey Architekten for their ongoing project – “Heidelberg Village” as the Most Outstanding Passive House Design in the World in 2016 on 10th November in London. 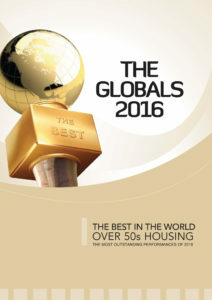 The Global Awards have been created to celebrate and reward the best individual and company performances in the over-50s housing sector worldwide. The philosophy of the Awards panel is to recognize the best exemplar in the world. 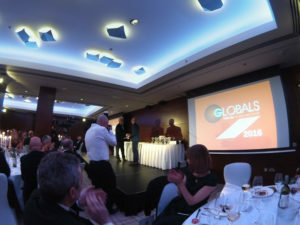 The Awards dinner and presentation was conducted at Conrad London St. James in Broadway, London, UK. The event was a formal presentation to the Global Award winners in the presence of nearly 80 experts who had come from all over the world including Australia and New Zealand. Nowadays one of the big issues in the world has become the housing of the elderly in a respectable way as well as providing them with the care assistance. Because of the demographic change, it is a worldwide concern for which the intelligent solutions are crucially needed. However, taking care of the elderly and people with special needs is not the sole problem in modern society but the energy providing for all the buildings is a subject too. Because of the climate change and winding down energy resources, it is necessary to come up with the solutions for the purposes of heating and cooling. Especially elderly and people with special needs are to stay in their apartments much longer than regular tenants do. Usually people go to work early in the morning and come back late in the evening meanwhile the elderly and people with certain disabilities are bound to be inside their flats sometimes 24 hours in a day. Therefore, these apartments need another design. What Frey Architekten are doing is to design and create very interesting living surroundings where elderly and youngsters, people with special needs and families, students and single moms, entrepreneurs and even little businesses are combined. This creates a very mixed living situation where life is not boring but exciting and nice. Furthermore, it is an easy and smart way to stimulate the neighbours to take care of the people who need some help. In addition, the quarter managers are in charge of holding shared events and stimulate the dwellers to come together. On the 10th of November the Global awarded Frey Architekten for their ongoing project – “Heidelberg Village” as the Most Outstanding Passive House Design in the World in 2016. One of the focuses of the Frey Architekten is socially and ecologically sustainable architecture and urban development. They plan projects according to the Five Finger Principal that encompasses ecology, affordability, innovation and profitability. Wolfgang Frey who is an architect and besides the owner of the architectural firm Frey Architekten and CEO of Frey Group, who is responsible for real estate development, investments and financing, has also all renting responsibilities and managing the needs of the tenants as well as energy provider, developed above mentioned innovative strategies and concepts for sustainable architecture. “Heidelberg village – Living Community” is a complex of passive ecological multi-residential houses where you can meet three generations of people with special needs at the same time. The complex occupies 6,100 square meters of land where will be five and eight storeyed buildings for residential and commercial purposes. The buildings will be entirely handicapped-accessible and have underground garages, also embracing modern sustainable features like solar panels, latest ventilation systems, vertical and rooftop gardens. Frey Group highly encourages sense of community and taking care of the environment. Therefore, there are quarters managers assigned at Heidelberg Village and the residents, starting from the children to the elderly, are encouraged to hold shared events, complete tasks communally, and spend time together. All of these things create a positive, friendly atmosphere and give the residents a feeling of responsibility for their environment. In addition, communal activities can aid in providing a sense of belonging, and even to make the residents feel more at home. “In former times large households and a strong sense of community were common. People shared responsibilities for taking care of the children, the sick, the elderly and the handicapped. This rarely happens in modern society. People have become more isolated and disconnected even though there are many more ways to come together. In Germany, there are lots of institutions for all kinds of people because of public demand. That is fine. But they are very expensive. Furthermore, for residents it often does not feel like “home”. Our habit of hiding our problems behind walls in industrial sized care facilities means we are losing our grasp on how to empathise and to care for those no longer as fortunate as the rest of us, or even our own grandparents. Just think, how valuable these skills are, and how much poorer our society as a whole would be if we were to lose them “ – says architect Wolfgang Frey. Each residential building is designed so that the tenants have the opportunity to meet and get to know one another in friendly featured halls as well as inner and outside courtyards. Building energy-efficient and multi-residential houses and also shifting the public opinion and make people live and think in a sustainable way is the huge leap in the modern architecture.